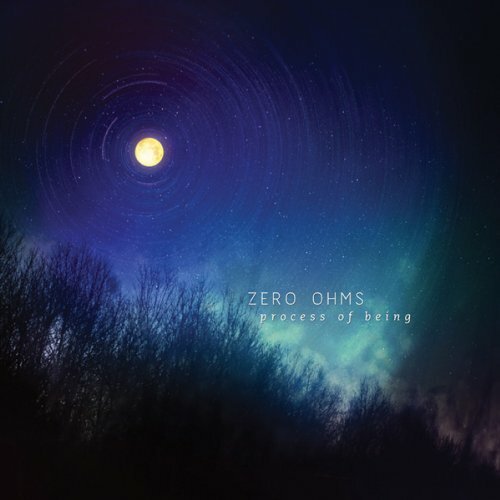 A master of floating atmospherics, Zero Ohms is the alias of wind player and composer Richard Roberts. He has a long list of releases going back to the mid-90s, including several recent collaborations with Craig Padilla on the Lotuspike label, although this writer first became aware of him on his 2002 Soundfall to the Infinite collaboration with Brannan Lane, at a time when we were covering all of Lane’s material in our pages. Here, with the six long cuts on Process of Being, he’s working completely solo, which means all sounds are produced on wind synthesizer, flute, bass flute and other indeterminate wind instruments, drenched in studio effects; it’s very melodic and colorful, but tending toward the dreamy and formless. There are no hand drums or percussion, no beats, no keyboards of any kind, and no vocals – just a heavenly ride through colorful space on a warm pillow of soft winds. One may experience a sense of freedom and timeless space as one track leads effortlessly into another, while the listener is guided down a gentle eternal path that imposes no restrictions. This is best as eyes-closed with headphones music, although its relaxing nature makes good accompaniment for just about any kind of endeavor one may encounter, short of operating heavy machinery. While most of this could certainly be considered floating ambient music, it’s brighter colors and lack of dark shadows and grisly textures also recalls many elements of impressionist 19th century classical music.